Two ill-fated drivers dominated the Atlantic headlines in 1975, Tony Brise and Gunnar Nilsson. Brise dominated the first three months of the season, winning eight of the nine races in the two championships and developing an unassailable lead in the John Player series. He joined the Hill GP team in May and was due to become team leader for 1976 before a plane crash brought his short career to a tragic end. Nilsson spent 1975 in Formula 3, winning the British title comfortably in his works March 753. He then moved to Atlantic late in the year and won the last five races of the season. Cancer would cut short his career after two seasons in F1 with Lotus. Although Brise appeared to have run away with the John Player title, Jim Crawford kept finishing second and took a win at Mallory Park in August ensured that he was still within right up until his Chevron retired at the last race. A string of second places was good enought to win the Southern Organs title for Ted Wentz as neither Brise nor Nilsson competed in enough races. The strong revival of Formula 3 during 1975 would have a significant impact on F/Atlantic which lost its sponsors at the end of the year. This series ran over 12 races and used a 20-15-12 points system. The other race was won by Nilsson in the Chevron B29. Points table from the John Player Motorsport Yearbook 1976 p161. This series was run over nine rounds and used a 9-6-4 points system. 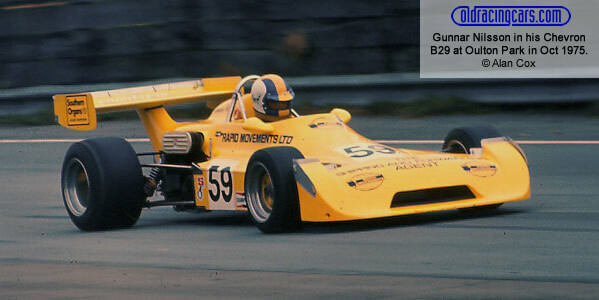 Tony Brise only appeared in four of the nine races, winning three and finishing third in the other. Gunnar Nilsson only joined the series in late September, but dominated the last four rounds, winning all four and taking three pole positions in the Rapid Movements Chevron B29. But it was Ted Wentz, with a solitary win but five second places who took the title. The results here have been compiled by Chris Townsend using Autosport and Motoring News. Not all the results are complete; results sheets or details of non-starters are needed for Brands Hatch 15 Mar 1975, Silverstone 13 Apr 1975, Silverstone 4 May 1975, Oulton Park 26 May 1975, Snetterton 29 Jun 1975, Snetterton 10 Aug 1975, Brands Hatch 14 Sep 1975, Brands Hatch 21 Sep 1975 and Thruxton 12 Oct 1975. The only entry list still needed is for Silverstone 3 Aug 1975. Grid sheets or details of qualifying are needed for most races: Brands Hatch 2 Mar 1975, Mallory Park 09 Mar 1975, Brands Hatch 15 Mar 1975, Snetterton 30 Mar 1975, Silverstone 13 Apr 1975, Brands Hatch 20 Apr 1975, Brands Hatch 18 May 1975, Snetterton 29 Jun 1975, Brands Hatch 13 Jul 1975, Silverstone 3 Aug 1975, Snetterton 10 Aug 1975, Brands Hatch 14 Sep 1975, Brands Hatch 21 Sep 1975, Oulton Park 4 Oct 1975 and Thruxton 12 Oct 1975. Chassis indentification is largely from chassis plate observations by Adam Ferrington and others, details of previous owners of second-hand cars (typically F2 cars which have been identified from F2 reports) plus Royale production records. A March 73B production list undoubtedly exists somewhere and a copy would be most welcome, as would Rondel production records. More details of the Martin, Kitchiner, Huron, Hawke and Wimhurst would also be very helpful.